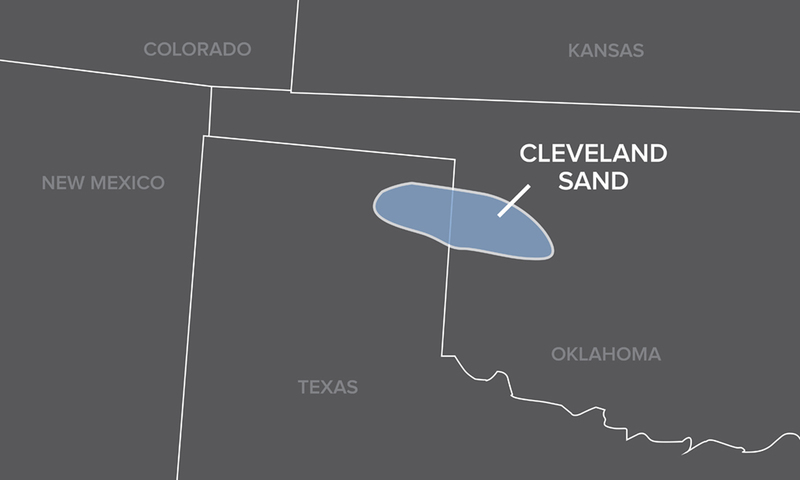 The Cleveland formation is a tight gas sand reservoir that covers 650 square miles of northeast Texas and western Oklahoma with estimated total gas reserves of over 1 Tcf. The Cleveland pay zone is approximately 20 – 80 ft thick at depths of 6,500 – 8,200 ft, with permeability values between 0.03 – 1.1 mD and 4 – 14% porosity. The Cleveland was discovered in the late 1950s and initially developed with hydraulically fractured vertical wells, with the first horizontal well drilled in 1997. However, extensive drilling of infill horizontal wells in the Cleveland did not show the expected enhanced productivity, despite the increase in reservoir contact. The challenges faced by operators in developing the Cleveland have been variable well performance, inefficient reservoir drainage, and marginal economics. Therefore, innovative stimulation technologies need to be continually evaluated to better exploit the reserves. A Texas operator working in the Cleveland completed its first well using cemented liner, “plug-and-perf” methodology. A number of operational setbacks were encountered, such as premature plug sets requiring drill out, which extended the time and cost of the completion. In addition, the production results were not as expected, which led the operator to use a Packers Plus StackFRAC® open hole multi-stage fracturing system for its second well. A 5-stage StackFRAC system was designed and run in the second well. The five stages were stimulated with no unexpected delays or operational issues, resulting in expected job rate and pressure profiles. Additionally, the stimulation of all five stages was performed in less than a day due to the continuous pumping design of the StackFRAC system. This was a significant decrease in time compared to the plug-and-perf method. The production results from the Packers Plus completed well were higher than expected, and time and cost savings were realized compared to the cased hole, plug-and-perf completion method. Together, these results have led the operator to continue using the StackFRAC system in the Cleveland formation. In 2008, the operator conducted a full-field study to compare production from 32 open hole StackFRAC completed wells with 177 horizontal offsets. The StackFRAC completed wells had consistently higher production values (best 3-month BOE) with cumulative production data showing a 50% increase in production over 6 months and 30% thereafter up to 3 years (Figure 1). Overall, Packers Plus StackFRAC technology has significantly increased completion efficiencies in all areas of the Cleveland tight gas sand formation, resulting in reduced completion costs and timeframes. Combined with the enhanced production, this approach significantly improves the return on investment for each well.